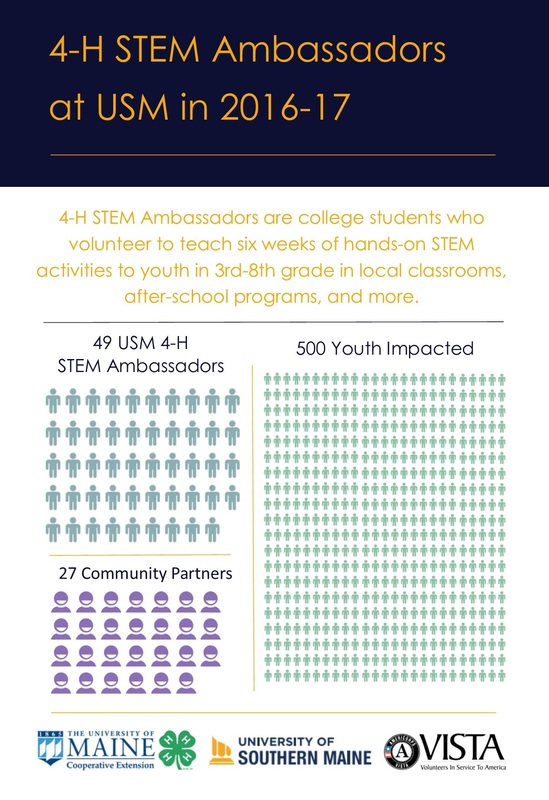 4-H STEM Ambassadors are trained USM students who facilitate hands on science, technology, engineering, and math (STEM) with youth 8-14 years old. This is a fun opportunity to work with youth while developing skills in leadership, project planning, presentation, problem-solving, and communication -- all skills that are sought after by employers. No STEM-specific background is necessary; all you need is interest in working with youth! STEM Ambassadors will complete hands-on training to understand how to work with and keep youth safe, as well as how to facilitate inquiry-based STEM activities. Check out the frequently asked questions to learn more. STEM Ambassadors commit to participate in volunteer training, individual preparation for their lessons, and a minimum of six one-hour workshops at community partner host sites. In addition to short online training videos, 4-H STEM Ambassadors attend two 2-hour training sessions, Session A and Session B. There are multiple options for each session. All Portland trainings are held in 423/424 Glickman, and all Bailey trainings are held in 204 Bailey. Please email Sarah Sparks at sarah.sparks@maine.edu to register for you trainings and receiving application materials. Note: if there is enough interest, there is potential for additional trainings. What Are People Saying About STEM Ambassadors? "It was really fun and exciting to get a taste of what I will eventually be doing for a living…Going into it I was wary because I didn’t really know anything about offshore winds but they made it very easy for us. The kit you get has everything you will need in it including a binder with lesson plans/activities to do with the kids utilizing the materials provided...It was a really cool experience because I was learning just as much from the kids as they were discovering from the activities." "Participating in this program provides USM students an opportunity to learn science through service and civic engagement. The program supports not only undergraduate students, but also youth and educators through hands-on science." Interested in becoming a STEM Ambassador? 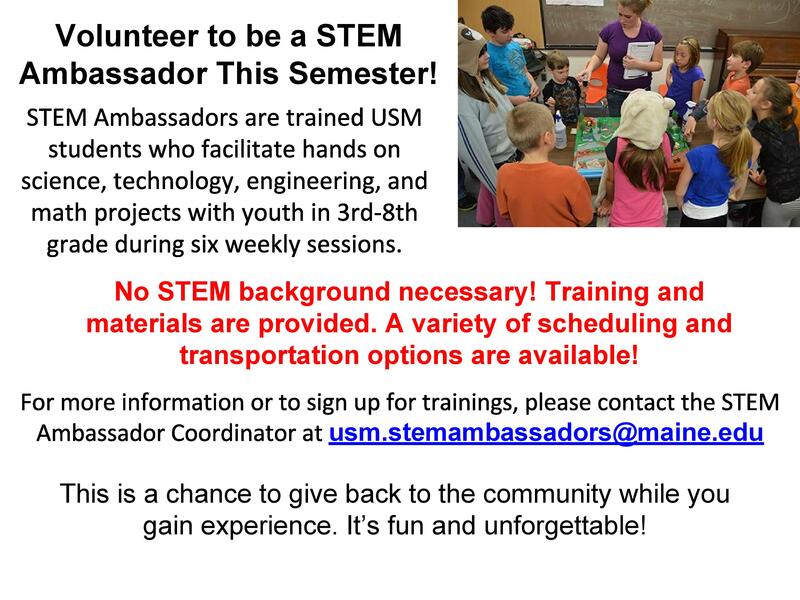 Contact Lauren Porter, STEM Ambassador Coordinator, at usm.stemambassadors@maine.edu.